A cookbook and backyard gardening and homesteading guide for women who want to grow food efficiently, cook seasonal recipes, or even try foraging, camping, and living off the land. 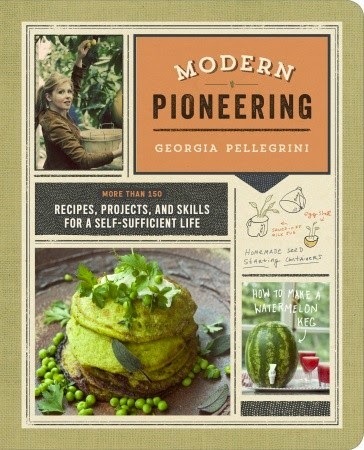 Georgia Pellegrini, outdoor adventurer and chef, helps you roll up your sleeves and tap into your pioneer spirit. Grow a small-space garden and preserve a little deliciousness for the cold months; assemble the makings of a self-sufficient pantry; learn to navigate without a compass for your next camping trip; or even forage for plants that give you energy. Packed with beautiful photographs and illustrations, Modern Pioneering proves that becoming more self-sufficient not only means being empowered, but also having a lot more fun. So, I may have squealed a bit with delight when I saw this book available. I mean, hello, I'm all trying-my-best-to-homestead over here. We've even recently added chickens to our family (I know, we are super stoked too). Well, not quite yet, they'll be here next week. And when I saw this book, clicked on it and read the description, it was like fate. This book HAD to have been written just for me. This book contains everything, seriously, from making your own butter to curing your own bacon. Who would have ever thought of preserving lemons in salt? Not this girl. And honestly, who knew you could eat marigolds? Yep, not me. Half of the book is made up of recipes. These are combined with chapters about the garden, the home, the wild and the rest. Mixed in are tips and tricks for almost any situation. Ever wondered how to be your own compass if lost in the woods? Or how to start a fire without matches? Yep, this book contains that as well. She even teaches readers how to pick a lock. If you are a homesteader, gardener or consider yourself a modern pioneer you need this book on your shelf. I can see this being used as a resource in this home time after time. &amp;lt;/center&amp;gt; WaterBrook Multnomah Publishing Group provided this book to me for free in exchange for this honest review as part of their Blogging for Books program.